The shopping mall is a caricature of the Greek agora, the classical space of democracy. It surrounds the citizens with an illusion of freedom of choice, while discouraging unpredictable behaviour, effectively turning them into passive consumers of their environment. Nevertheless, as other open and multifunctional spaces in the modern city are becoming obsolete, it may be the only site where public assembly still has a latent political significance. 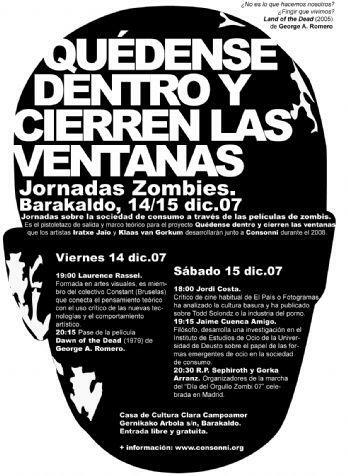 Edited by Iratxe Jaio y Klaas van Gorkum and published by consonni, this publication is a collection of theoretical writings, quotes and memories related to the zombiewalks that occurred in Utrecht and Barakaldo. It contains texts written by, among others, the cinema critic Jordi Costa, the philosopher Jaime Cuenca Amigo, the director of The Showroom in London Emily Pethick, the artistic director in Fundación Tapies (Barcelona) Laurence Rassel, and a comic by Maaike Hartjes. The designer of the publication is Roger Teeuwen in collaboration with Nele Vos. Distibution in Spain by Cataclismo. La Marcha Zombi Barakaldo de 14 junio 2008. Saturday 19 April 2008. A day to never forget. Ominous moans and spine-chilling screams echoed between the highrises in Overvecht. Ghostly apparitions pushed their way through the neighborhood, leaving a trail of blood. Half human, half monster, it is clear that these beings must have crept out from the underworld, to roam the earth. Followed by the spooky orchestra Tegenwind, beguiling the onlookers with their haunting music. During the city council elections of Rotterdam in 2010, six campaign billboards were clandestinely removed from public space, replaced with new ones, and mounted in a group show that examined the relationships between art and politics. 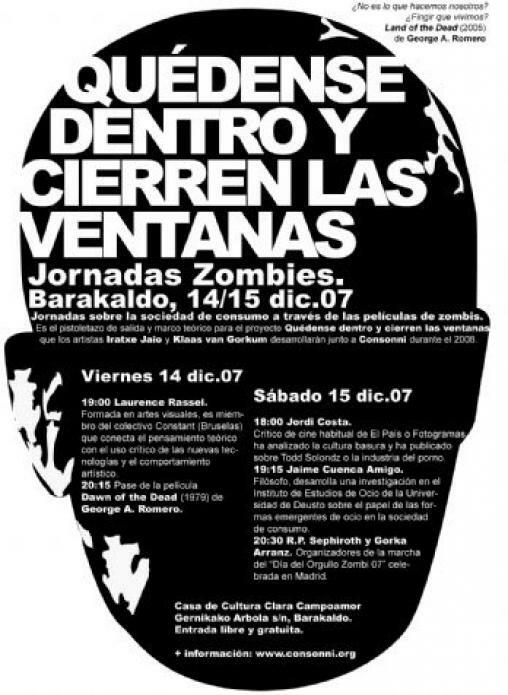 A seminar on consumer society, through zombie movies, within the context of the Barakaldo municipality. 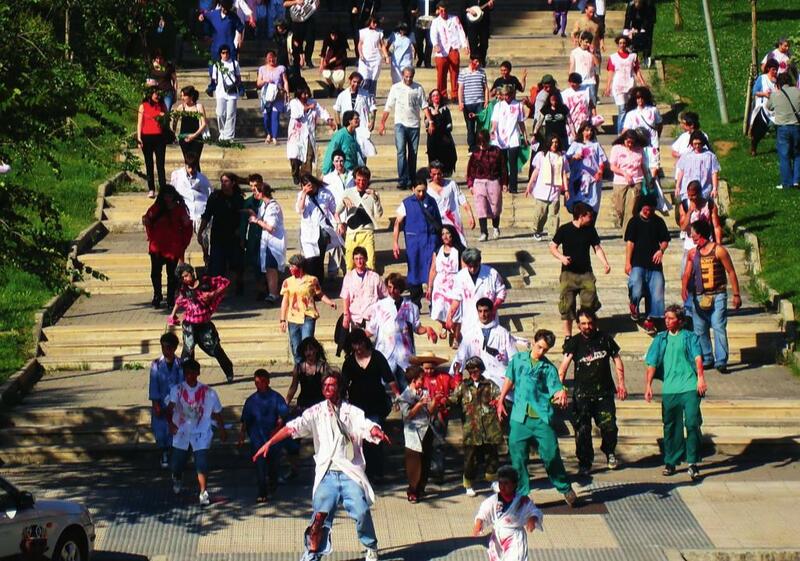 Neighbourhood residents were invited to join in a morbid parade that lead to the local shopping mall, where the participants, dressed up like bloodied corpses, would mingle with the startled customers, in a collective action between performance, dérive and street theatre. 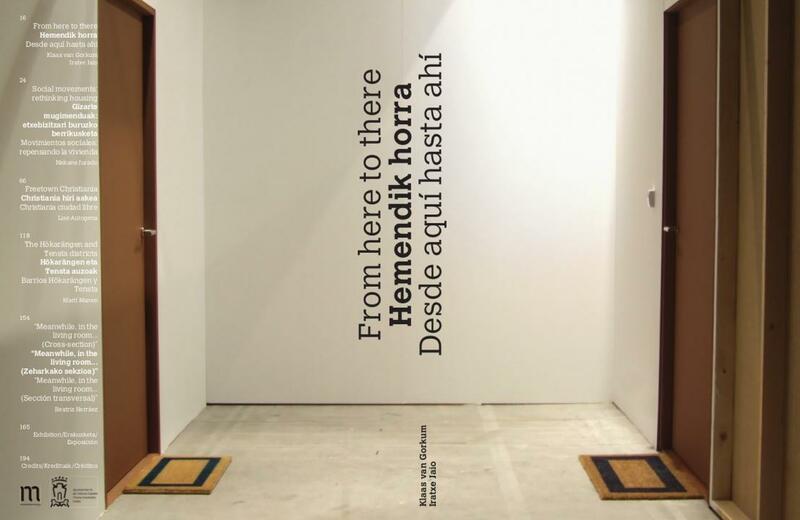 Desde aquí hasta ahí (From here to there) is a video which explores the notion of home, within the context of the urban expansion of Vitoria-Gasteiz, the capital of Basque Country. It follows a group of young adults as they enter a new stage in their lives, such as during the purchase of a house, marriage, or the birth of a first child. These personal experiences are juxtaposed with the distant, god-like perspectives on the city, as seen by the civil servant, the politician, or the architect. Beatriz Herráez on "Meanwhile, in the living room..."
Depending on what you are after, choose an area, a more or less populous city, a more or less lively street. Build a house. Furnish it. Make the most of its decoration and surroundings. Choose the season and the time. Gather together the right people, the best records and drinks. Lighting and conversation must of course be appropriate, along with the weather and your memories. If your calculations are correct, you should find the outcome satisfying. Read more about Beatriz Herráez on "Meanwhile, in the living room..."
The production of home runs like a red thread through this publication, which is the printed counterpart to the exhibition “Meanwhile, in the Living Room... Sección Transversal”, in Centro Cultural Montehermoso. It combines the investigation of the artists Iratxe Jaio and Klaas van Gorkum into the urban expansion of Vitoria-Gasteiz with documentation of their final installation, and stills of their video ‘Desde aquí hasta ahí’. A full-scale reconstruction of an apartment that is being built in the new suburbs of Vitoria-Gasteiz, and guided tour leading from those suburbs to the exhibition space in the center of town. This publication reads as a kind of storyboard, with drawings that are based on the video produced during a working period at the BilbaoArte Foundation in Bilbao, and stills from the installation that was exhibited in “Home at Tent”, in TENT, Center of Contemporary Art in Rotterdam, the Netherlands. The images are woven together with a text by Miren Jaio, who at the hand of four scenes from well known movies, reflects on the role of the family institution in the configuration of the borders between private and public space. Videorecording of the bluescreen installation. 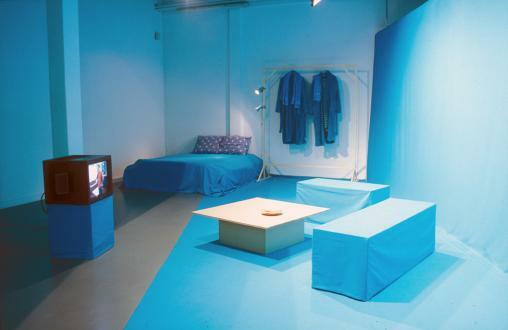 Using bluescreen techniques, the audience to an exhibition is cut and paste into a livingroom from the neighbourhood. A collection of drawings, traced from videostills and digital documents: an ever growing storyboard that plots the uneasy relationship between the model and reality, between urban planning and concepts of life, family and reproduction. The purpose of OpTV is to act as a window on the transformations that Transvaal is going through, connecting experiences of daily life on the ground to developments in society, and placing them within a broader framework of changing political policies. The challenge is how to achieve this without getting caught up in the problems of misguided representation, given that we interpret Jack as a beautiful, but suspicious vehicle of ideology. OpTV combineert hoge cultuur met lage cultuur, activisme met overheidspropaganda, en nodigt buurtbewoners uit om met eigen materiaal een bijdrage te doen. OpTV kan worden beschouwd als een onderzoek naar de taal van het medium, waarbij de inhoud van het programma ingezet wordt voor een ondoorzichtig en ambigue ideologie. On a number of occasions OpTV interrupted the normal program to go live. People from the neighborhood were invited to come and say whatever they liked into a microphone, set up in front of a blue screen. As they spoke, their message was transmitted live on the OpTV screen. 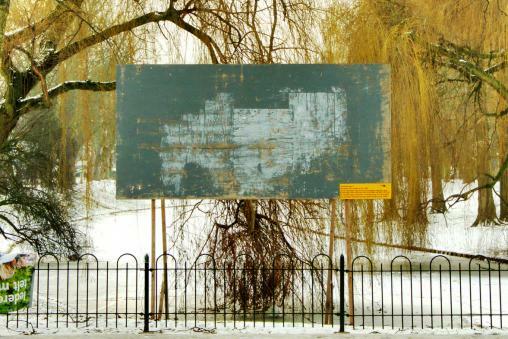 Using a chroma key technique, well known from weather reports on TV, the blue background was substituted with a selection of 200 images that belong to our visual culture, collected from magazines or television. Local musicians improvised on these images, kids outdid each other in macho gangster rap, and there were spontaneous talk show discussions. One of the more distinct moments was when a Transvaal resident formulated a manifesto against the misuse of urban renewal strategies for property speculation. At a local Blockparty on the Joubertplantsoen in Transvaal, OpTV set up an interactive TV-studio in collaboration with Annechien Meier and Sabrina Lindemann from OpTrek. Visitors were asked the questions: “Where do you come from?” and “Where are you going?”. These seem like simple questions, but in a neighbourhood where the inhabitants are moved out in favour of urban renewal, and in a climate where ethnic origins are regarded with increasing suspicion, it generates answers on many different levels. Participants were offered a map according to the scale of their response, on which they could trace the answers.